Tools to aggregate Oracle CRS logfiles in one file, filter it, sort it, and display it. 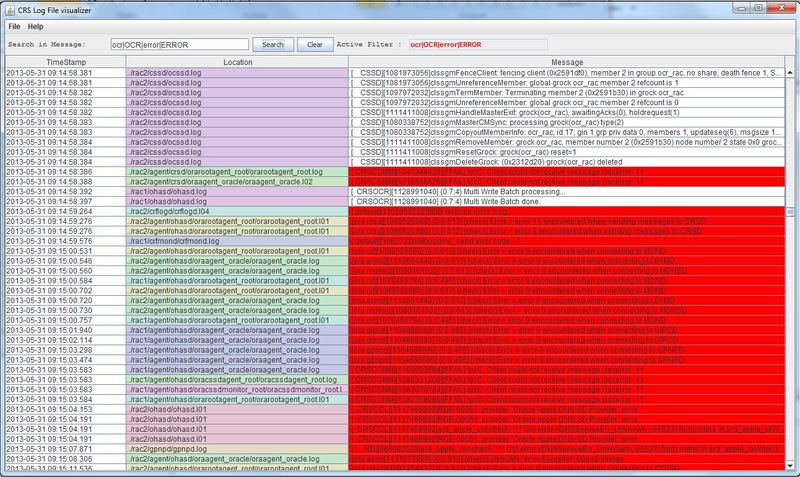 If you already faced RAC problems, you had to analyze log files from the entry points which are the alert.log files. But as Oracle clusterware logs its events in many logfiles (usually one per process), and you have a logfile directory on each server, it can be difficult to detect the causes, and specially the root cause of a specific problem. Recently I created a little perl script that will help me for this purpose. This script is named “crs_log_aggregator.pl” and is available for download at this URL : https://app.box.com/s/xi3h7bpssrqtkp55q43c. This script works like this. As input, it takes one or n directories to analyze recursively. Those directories are containing all crs log files of all cluster nodes you want to analyze. For each directory, it parses each log files (except the alert.log) and each history log files (with file extension: l??). Parsing will get the timestamp mentioned in the read line, if there’s no timestamp (because message is written in many lines for example), the perl script will use the preceding timestamp. (If there were no timestamp for example, in the file header, it will flag the timestamp as ‘N/A’). 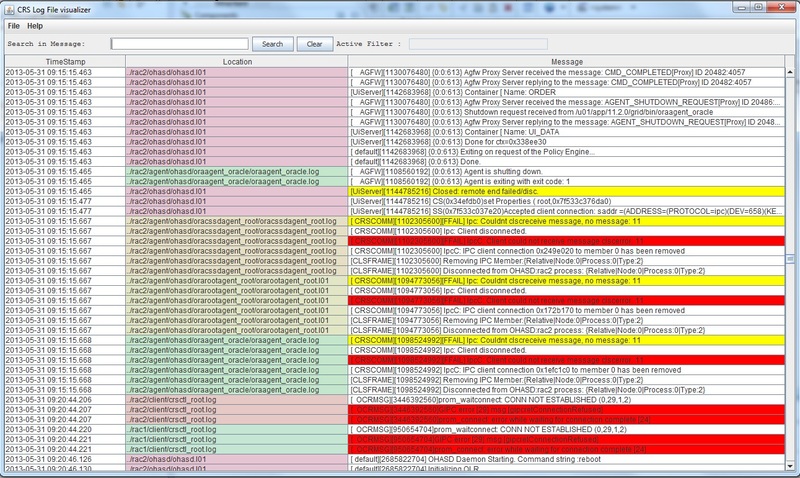 Every analyzed line in the log file, is completed by its origin represented by the relative file path. As a separator, I used a “<SEP>” tag. So at this step, each line is recorded in a single unsorted file. If a filter expression has been given to the program as input, which is highly recommended, the filter is applied during the parsing process. Next, the program will sort the output file by timestamp and will produce a single output file which is now filtered (or not) and this file can be analyzed. For example, let’s consider a two nodes RAC (hostnames are rac1 and rac2). As alert.log files are not analyzed, you need to analyze them before to see when the problem occurs. In my case, I want to analyze 2 days: 2013-05-30 and 2013-05-31. So first step is to copy is a filesystem, or on your desktop, all the logfiles. 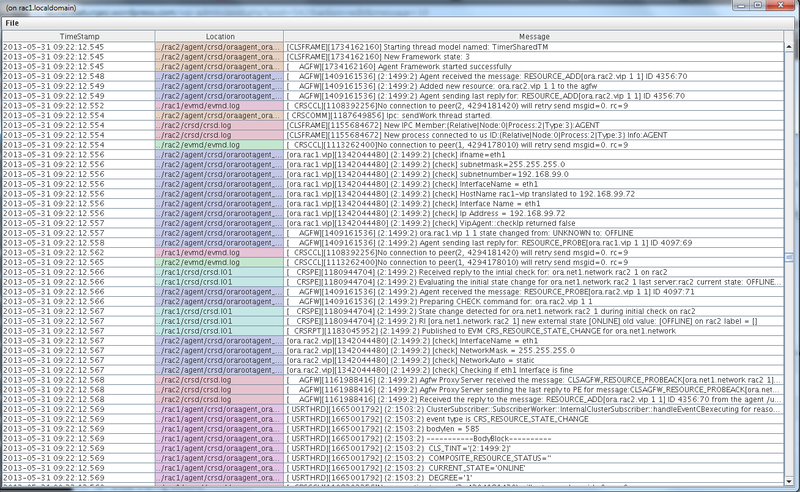 [oracle@rac1 aggregator]$ tree -d .
will sort without any filter all log files (*.log, *.l??) recursively found in the data directory. outfile is produced in the current directory as a result. will sort without any filter only the content of data/rac1/cssd,data/rac1/crsd  directories. will sort with a filter (regex) that will filter 2 days 2012-10-26 and 2012-10-27. Please note that, if an alert.log file is found, it will be excluded and mentioned in the standard output. I highly recommend you to use a filter to reduce the amount of data to sort (It can burn lot of CPU and memory). The -f option is use to do this, and takes a regexp style filter (it ‘s used directly in the perl script, so if you are not aware with regexp used in perl script, you can have a look at this URL: http://perldoc.perl.org/perlre.html). 2013-05-31 09:15:00.270<SEP>../rac2/ctssd/octssd.l01<SEP> [    CTSS]sclsctss_gvss8: Return  and NTP status . 2013-05-31 09:15:00.270<SEP>../rac2/ctssd/octssd.l01<SEP> [    CTSS]ctss_check_vendor_sw: Vendor time sync software is detected. status . 2013-05-31 09:15:00.314<SEP>../rac2/ctssd/octssd.l01<SEP> [    CTSS]ctsselect_vermon7: Expecting clssgsevGRPPRIV event. Ignoring 2 event. 2013-05-31 09:15:00.314<SEP>../rac2/ctssd/octssd.l01<SEP> [    CTSS]ctsselect_vermon7: Expecting clssgsevGRPPRIV event. Ignoring 3 event. 2013-05-31 09:15:00.314<SEP>../rac2/ctssd/octssd.l01<SEP> [    CTSS]ctsselect_vermon7: Expecting clssgsevGRPPRIV event. Ignoring 1 event. Now, you can analyze the output file directly, but I have developed another app (in Java). This app is available at this URL: https://app.box.com/s/xi3h7bpssrqtkp55q43c. To launch it, you need to use java 1.7.
in v0.2, I implemented a filter function. This filter is active on the “Message” column. I implemented a colorization function for the “Message” column. If you have any suggestion to improve these tools, send me an email or a comment. I will study them. Each release of Oracle Database comes with many new views. Those views are detailed above, some of them are documented, others not. This list has been automatically generated between 12.1.0.1 and 11.2.0.3.0. I have tried to be as precise as possible by searching every link in the entire documentation. If you see a unlinked view, please comment the post and give me the missing URL. Do you want to use BBED … on Windows ??? Recently, I had to use BBED in a windows 2008 R2 environment (to modify a checkpoint SCN in datafiles headers). To do this, I like to use BBED but this time, it was on a Windows 2008 R2 server on a 11.2 database. – BBED is not shipped with Oracle since version 9. – There’s no makefile on windows to compile bbed. In a previous post, I wrote a little hack to compile bbed on Unix systems and to use it with oracle 9, 10, 11 and every database that have its datafiles located on a mount point (not for ASM). On windows, to bypass this, you can copy your datafiles on a linux box, repair them with bbed, and copy them back to their original location. But when you work remotely or/and your database size is hundreds of Gigabytes … the problem is different. You need a bbed.exe. The only way is to get it from an Oracle 9i installation. You need to have a bunch of DLL (see above). All thoses DLLs are available in an Oracle 9i installation (in bin directory). You need message files for BBED. Thoses files are “bbedus.msb” and “bbedus.msg”. They are located in the mesg directory of an Oracle 9i installation. And you need to copy them in the rdbms\mesg directory of your ORACLE_HOME. C:\bbed>systeminfo | findstr /B /C:"OS Name" /C:"OS Version" /C:"System Type"
Now, you have a bbed exe on Windows 2008 R2 server.